The Love Poems of Rumi. Ahhh. Need I say more? 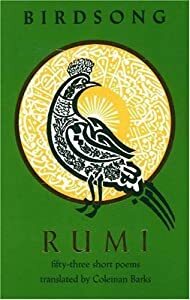 Well, for those of you who are not familiar with this poet, born Jalal ad-Din Mohammad Balkhi in Persia, early in the thirteenth century, this poet, named Rumi for the city in which he lived, composed works of mysticism, and desire that inspires millions since he wrote them. The deepest longings expressed through his passions of the human heart for its beloved, and the kind of transcendent intimacy which is a source of the divine. This book was given to my by my dear friend, Eric, almost 15 years ago. Thanks for the gifts you have given me, sweetness. This entry was posted in National Poetry Month videos on April 7, 2013 by Robert Vaughan. I’ve been exploring for a little bit for any high-quality articles or weblog posts in this kind of space . Exploring in Yahoo I ultimately stumbled upon this site. Reading this information so i am happy to express that I’ve a very good uncanny feeling I discovered just what I needed. I will make sure to do not omit this website and give it a look on a continuing basis.